Click Here for my latest interview on WYFM2! 5 Bad Decisions People Make that Deplete their 401(k) Retirement Savings. Defined contribution pension such as 401(k) plans have become the default support in retirement for millions of Americans. Industry data reveal that with three-quarters of employers using 401k plans as the main pension option for employees, they have in essence supplanted the guaranteed pension plans of the past three decades. Unfortunately, bad decisions people make that deplete their 401k retirement savings has forced many elderly Americans into poverty or living below their accustomed standards. The number of seniors who drop into the supplemental poverty level is determined by their pre-taxed income; if they are still able to work and government benefits versus cost for housing as well as for critical goods and services. 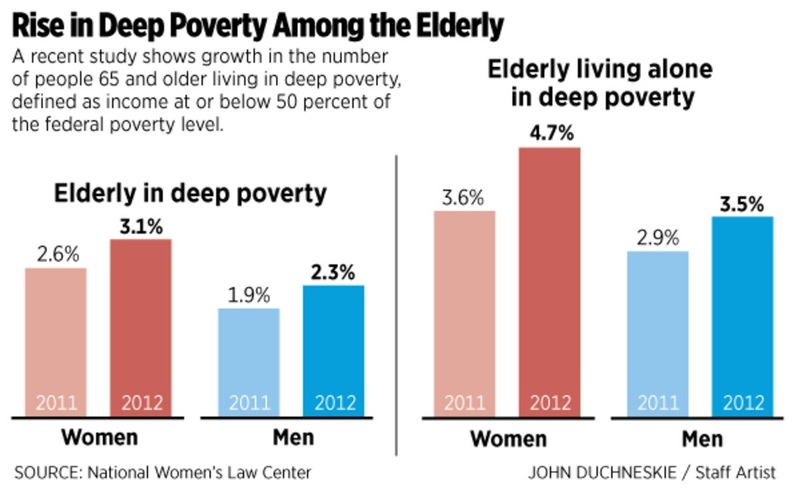 In fact, based on annual social and economic data, there has been an insidious and continuous rise in the number of individuals age 65 and older that are living in extreme poverty with the highest percentage among women. Studies also show, that while women are just as conscientious about socking money away into a 401(k) as their male counterparts, they are more prone than their male counterparts to have less in savings due to disparity in income and the fact that statistically, women out live men by five to ten years. However, the most persistent reasons both men and women pull funds out of their 401(k) that ultimately impact the quality of their retirement years include an unexpected financial crisis such as the loss of a job or a serious major illness. However, making some of the following bad decisions have been shown to reduce or seriously deplete 401k retirement savings. 401K Abandonment. It is not uncommon for people to abandon their 401(k) after switching jobs. In fact, data from S. Department of Labor estimate that approximately 1,650 401(k) plans holding $868 million or more in assets that cover about 33,000 workers are abandoned every year when people change jobs. Contributing to this problem in-part is the fact that some people don’t know what to do about their 401k. Most do nothing if they have been terminated or voluntarily switch companies. The problem with doing nothing however is that whether the employer transferred the money to an interest-bearing federally insured bank, a savings association account or to a State's unclaimed property fund, the former employee who abandoned the plan lost any money that had accumulated through payroll deductions and employer matched contributions if they fail to claim these funds. A longer than expected lag time between jobs. No emergency fund or savings in reserve to absorb days of unemployment. Getting a lump sum from a cashed-out 401k can trigger an emotional spending spree. Failure to seek appropriate counsel about reinvestment options for 401k savings. 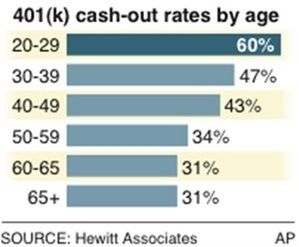 The following Hewitt Associates Chart highlight the cash-out rates by age group. A new study indicates that one in four American workers will dip into their 401k retirement account to meet current expenses or for other reasons before they reach retirement. Still, a 401k retirement plan remains one of the most useful and advantageous strategies for skirting the poverty level in retirement. As such, finance experts encourage employees to take full advantage of this valuable retirement investment tool to build a stronger financial foundation for the future. In the event that you lose your job or change jobs soon after receiving the loan, immediate repayment of the money is mandated or it is considered as a cash withdrawal. The penalty on a cash withdrawal from a 401K is 10 percent of the amount of the distribution, in addition to the full amount of the regular income tax on the cash out. 4.Early 401k Withdrawal. Although it is always within your right to withdraw your 401(k) contributions and their earnings at any time, making a withdrawal before the age of 55 can put you at risk off stiff penalties. For instance, any amount withdrawn will be treated as taxable income that, based on the amount pulled out can put you into a higher tax bracket for that year. In addition, you will also be subject to an additional 10% early distribution penalty. Waiting too long to enroll. The sooner an employee enrolls in a 401k plan that has matching contributions from an employer the faster they will accrue savings. Employees who delay signing up for their employer's 401(k) plan lose out on tax-deferred gains on the money they could have saved and invested. Failing to incrementally increase contributions. Based on industry data, the average contribution by workers in a 401(k) is approximately 6%. Calculations of the average amount an individual need to save during their working life in addition to social security benefits for a comfortable retirement is 10% or more annually. Incrementally increasing 401k contributions to 10% or more also increase employer contributions that creates a favorable boost in your retirement funds. Overlooking the benefits of catch-up contributions. To aid baby boomers who are notorious for not saving enough for retirement, congress has included a “catch-up contribution” option to retirement plans. This enables individuals who are 50 years of age and over to increase their 401k contributions up to $6,000 for their retirement years. 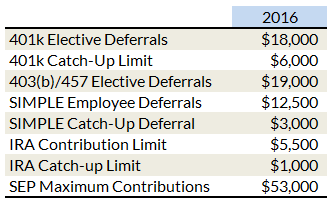 The following IRS 401k Contribution Limits Chart is an example of catch-up contribution limits for 2016.